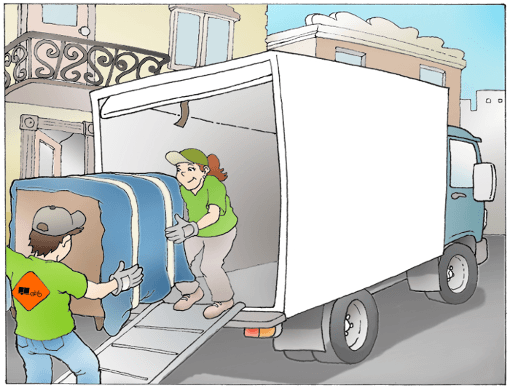 Choosing a reliable mover is crucial to avoid your moving experience turning into a nightmare. There are hundreds of moving companies in the Greater Montreal area and one can find thousands of stories about wronged clients. We have compiled the following list to help you make a well-informed choice. On the hundreds of reviews we have analyzed, the most common complaints are by far uncompensated damage, the movers’ inefficiency, followed by inappropriate attitude of the employees, hidden costs and delays. Beware of an attractive hourly rate, which could in the long run be expensive by way of overbilling and repairs. Word-of-mouth may be a good start but often the service quality will vary throughout the company. Many websites suggest calling a few companies and verifying their reliability by asking a list of questions. The catch may be that unscrupulous movers may give you the answers you wish to hear. On other websites, some companies are being cited but without mentioning the selection process involved. This is often disguised advertising. Some websites will have you fill out a form to get quotes from many companies but whose partners are chosen in an arbitrary fashion. As far as we are concerned, there is only one clear way to make a decision: base your decision on client feedback provided on the Internet. The higher the average rating of a company, the better you may be confident that it will treat its clients well. A company may, of course, cheat by asking relatives to leave false accounts, but an unscrupulous company will not be able to avoid getting bad reviews and maintain a high ranking at the same time. So here is a list of the 10 top movers of the Greater Montreal area. Many of them are real gems that won’t show up in rapid search results, because they may be listed under their more or less commendable competitors. In order to qualify, they must average at least 4.5 stars based on at least 50 ratings on Google and Facebook. * Since the 10 best companies all have a minimum average of 4.8 stars, we consider each one of them capable of offering as good a service as the other ones. Thus the order in which they are listed is arbitrary: the ones listed at the top with a link to their website contribute financially to the advertising campaign giving visibility to this ranking list. Most of the movers outside the Greater Montreal area don’t qualify for the 4.5 stars average based on at least 50 reviews, with the notable exception of two companies: Dmax Express in the Laurentians with 4.7 stars based on 232 reviews and Déménagement à Prix Modique in Quebec City with 4.7 stars over 62 reviews.